"My answer to that has changed, actually. It always used to be that it's just a bit of fun. But then sometimes we've done some things where we did explicitly refer to other episodes. I think the rule is that when a character says something that explicitly refers to something else, it's canonical. Also, they follow the same dream universe. That's the other thing that I tend to say. There's a line in Hated in the Nation where someone refers to a crime that happened in White Bear." Back in September 2015, Netflix ordered 12 episodes of Black Mirror, six of which represented Season 3, which debuted on the streaming service back in October, and six more episodes that will represent Season 4, which hasn't been given a premiere date yet. There was also a much-celebrated "crossover" of sorts with Netflix putting together a video that mashed up the worlds of Black Mirror and their hit prison comedy series Orange is the New Black. Charlie Brooker also revealed in his wide-ranging interview with The Hollywood Reporter that the Netflix social media team does a great job, while hinting what it would be like to actually cross over with another Netflix series. "I think they do a really good job with the social feed, as well as the video that mashed up Orange Is the New Black with the San Junipero episode. They came to us and we shipped the neon sign over. We should do more mashups with other shows, that would send the Easter egg people into overdrive. An interesting mental challenge would be to think about how to work that into a Black Mirror story where it'd be a way of breaking the fourth wall. We'd probably do it where someone finds themselves trapped in House of Cards or something, where they know it's a fictional show they are trapped in. That's probably the way we would do it. Talk about having difficulty about stripping reality." 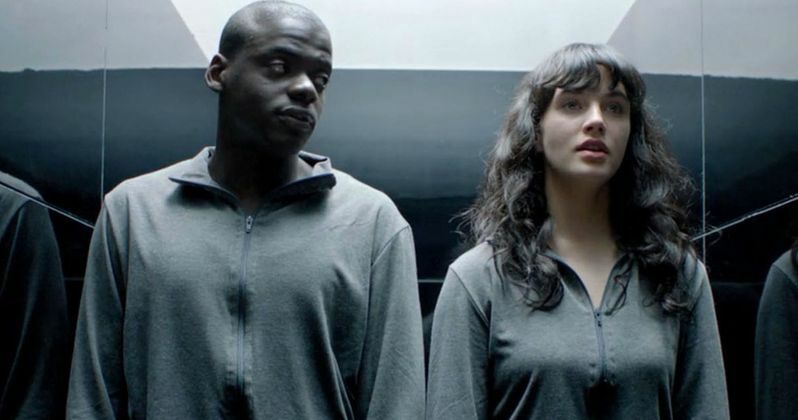 This interview comes just days before the first Black Mirror Season 4 trailer was released, with the streaming service also revealing the episode titles and cast members for each episode. The first episode, "Arkangel" features a cast including Rosemarie Dewitt, Brenna Harding and Owen Teague, with actress/filmmaker Jodie Foster directing. "USS Callister" features Jesse Plemons, Cristin Milioti, Jimmi Simpson and Michaela Coel from director Toby Haynes, while the third episode "Crocodile" stars Andrea Riseborough, Andrew Gower and Kiran Sonia Sawar from director John Hillcoat. "Hang the DJ" stars Georgina Campbell, Joe Cole and George Blagden, with Tim Van Patten at the helm, followed by "Metalhead" starring Maxine Peake, Jake Davies and Clint Dyer (Hope Springs) from director David Slade, and the final episode "Black Museum" starring Douglas Hodge, Letitia Wright and Babs Olusanmokun, directed by Colm McCarthy. Hopefully we'll find out soon when the new season of Black Mirror will debut.